This is the full story on the rise and fall of Rayfish Footwear. A more extensive overview can be found on the website of the Next Nature Network. We welcome you to share your comments here. After numerous attempts to attract new investors, we regret to announce that Rayfish Footwear Inc. filed for bankruptcy this morning. We thank all our fans for the warm support you have given us. This story is not over. Next week we will reveal the entire story on the Rise and Fall of Rayfish Footwear. One of our stolen stingrays was spotted by tourists near Ko Samui. Amazing to see how big they have grown! Send us your pictures if you happen to spot one. One of our stolen stingrays was spotted by a Scuba diving tourist in Koh Lan! This is the Nemo Species that was bred in one of our prototype trails. Teardrops in our eyes. It is such a sadness. Two of the numerous fishes that have been stolen from our fish breeding facility have been found washed up on beaches. On Sunday 12th of August, a group of animal rights activists broke into the fish breeding facility of Rayfish Footwear, destroying lab equipment and sneakers, and stealing numerous living stingrays. In his video response, CEO Raymond Ong expressed deep regret over the loss: "Not only is this crime a terrible setback for my company and employees, it is also a personal tragedy." Dr Ong acknowledges the conflicted public response to Rayfish's bio-customization technique, but emphasized the company's commitment to excellent working conditions for its staff and to the humane treatment of its stingrays. "Rest assured that I fully understand that radical technological advances often make us uneasy," Ong said, adding, "We need to get over our unwillingness to change. We need to learn love the future again." Ong also noted his concern that the genetically modified stingrays may interbreed with wild populations. This Sunday, August 12, at approximately 3AM, activists broke into the headquarters of Rayfish Footwear, destroying lab equipment and sneakers, and stealing numerous living stingrays. A video uploaded by the perpetrators on YouTube depicts masked men removing stingrays from the Rayfish aquaculture facility and releasing the animals into the nearby ocean. We are asking our fans to help us catch these criminals. Any information about the identities of these thieves can be sent to tips@rayfish.com . Please, serious leads only. A reward of 40,000 baht is also being offered for the return of any of the stingrays that were released into the wild. We urge whoever catches one of our rays to make all attempts to keep the animal alive and comfortable. We are currently assessing the damage to our company. Our CEO Raymond Ong will make a formal press statement on the situation tomorrow afternoon. Dear Fans, This weekend our stingray breeding farm was struck by vandals. We're assessing the situation and keep you updated on this unfortunate event. With over 5000 submitted shoe designs, you're bound to get some duplicates. 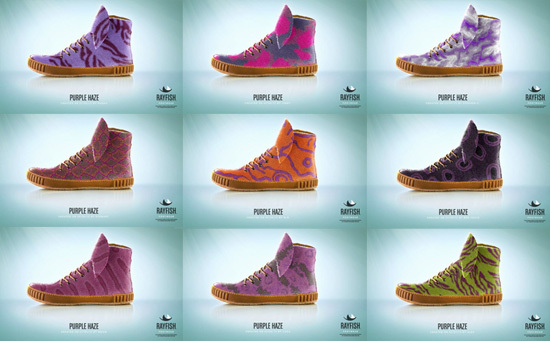 For instance, already nine shoes titled 'Purple Haze' were submitted. Enough now folks! Who's rocking stingray leather sneakers? Sneakerhead Chad Bojang is rocking them, after winning a free pair with his marvelous SnakeTongue design. Word up. Thanks for the great video Chad! Take this design as your starting point. Ling Chow is the winner this round with the Koi Karper design. Our jury loved how an existing animal pattern was fabulously simulated by crossing the clownfish and tabby-cat swatches. Take Lings design as a starting point for you own design. After the launch of our company website, many have been baffled by our pattern design tool. How could we get tiger genes into a stingray? How did our scientists manage to find a sample of “dragon” DNA? Some experts even argued this was downright impossible. Indeed, things aren’t exactly as they seem, at least in our design tool. It’s true that transplanting complete gene sequences from mammals into fish is too far advanced, even for us. Mammals use a completely separate class of color-determining cells than cold-blooded animals. While our stingrays are transgenic – our scientists implant novel DNA into the one-cell embryos – they don’t incorporate genes from mammals, worms, arthropods or anything else. During the initial research phase, our scientists successfully implanted DNA sequences from other cold-blooded animals such as snakes and fish into the stingrays. However, we’ve since improved on this rather imprecise process by switching to entirely synthetic genes. Our comprehensive library of patterning genes is not used as a readymade set of implantable DNA, but as an important reference during early research. So if our rays aren’t swimming around with dalmatian DNA, where do they get their unique coloration? 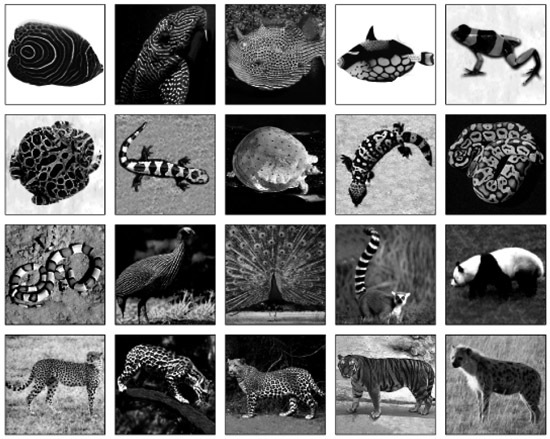 As Alan Turing first hypothesized, and as many subsequent studies have shown, nearly any animal pattern can be generated through the interactions of two different morphogen molecules. Turing-type equations govern everything from an ocelot’s spots to an angelfish’s stripes. 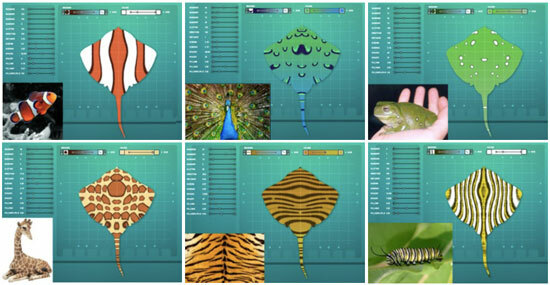 As can be seen in our prototype design tool, pictured above, our technical team can control multiple variables in order to closely replicate the patterns and colors seen in other animals. Names like “phoenix” or “bambi” are just their creative interpretations for these patterns that help to make the design of a shoe an easy and playful experience for our customers. Except, of course, for “dragon”. Our director Raymond Ong keeps a real one under his desk. 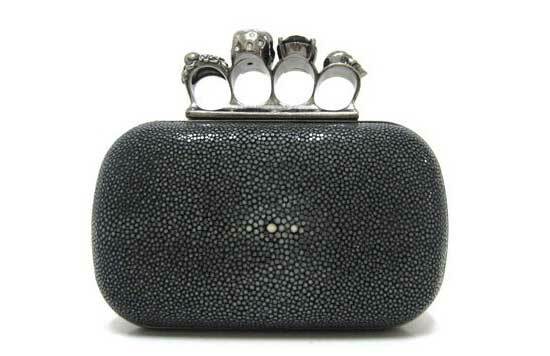 Don't you think this stingray leather bag by Alexander McQueen is just awesome? Could use some bio-customization though. Wayfish Frootwear? Watch Out for Knock-Offs! 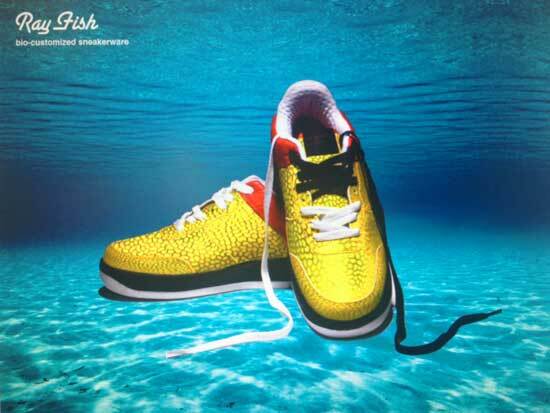 We discovered some companies have been trying to pass off second-rate shoes as genuine Rayfish.com sneakers. These are the same people who manufacture Iplod Mp3 players and Dolce and Guarana sunglasses. The fake sneakers are made from cow leather or pleather, and covered with plastic to mimic the bumpy texture of real stingray skin. Our representatives have spotted them in China, Thailand, and the Philippines. You might have seen some in your own city. 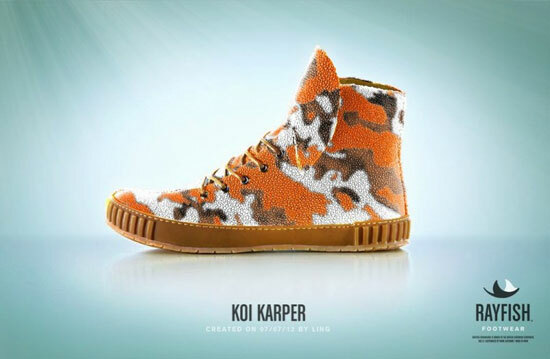 They are sold in shops as 'biocustomized shoes' even though you cannot personalize them at all. How can you tell if the stingray leather on your shoes is real? First of all, Rayfish Footwear does not sell shoes in retail stores. All our shoes are uniquely personalized via our online design tool. Secondly of all, the 'grains' of ray skin, also called placoid scales, are a part of the skin. Glued-on plastic pieces can be pulled off. Real stingray scales are neatly and closely arranged, with no gaps between them. Plastic looks sloppy. If you're ready to risk some destruction (and burned fingers), stingray placoid scales are also resistant to the flame from a lighter, or to being punctured with a red hot needle. Plastic will melt or be pierced through. Accept no substitutes! The first and only bio-customized stingray sneakers come from Rayfish Footwear. For now, you can only get a pair of our shoes by winning our design contest. Who knew stingrays were such photogenic creatures? When Rayfish Footwear goes into commercial production in just a few short months, we will be installing webcams in every tank. That way, you’ll be able to watch your stingrays grow from babies no bigger than your hand, to adults a half-meter across. Check in for feeding times, or just relax as you watch them “fly” through the water. Voyeuristic? We don’t think the rays will mind. And it helps us to ensure the transparency and humane operation of our aquaculture facility. In the meantime, keep designing! 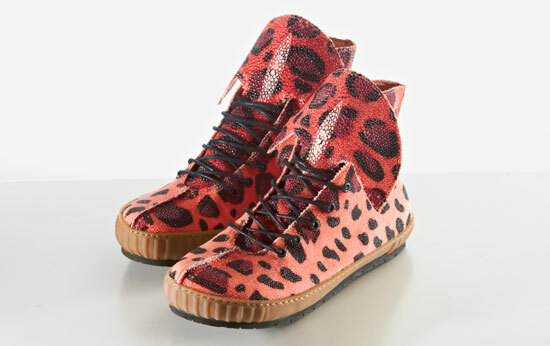 We delivered this dragon leopard sneaker pair to a celebrity who's name we cannot mention. Don't be surprised if these appear in a concert hall near you soon. Barbara Tetas is the winner this round with the classy 'Rustic' design that stoot out amidst the rainbow of spectacular designs that were submitted in this round. The jury applauds the timelessness of the design. Take Barbara's design as a starting point for you own design. It’s a bit of a myth to say that "Indians used every part of the buffalo". Every part could be used, but not every part of the buffalo was used on every occasion – after all, certain tribes even perfected the art of the buffalo jump. 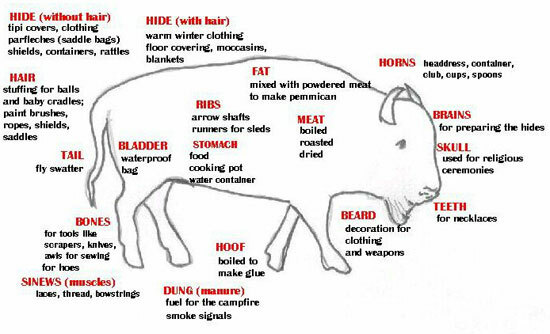 Nevertheless, "using every part of the buffalo" is a helpful concept when it comes to respecting animals raised for human use. At Rayfish Footwear, we strive to use as much of our rays as possible. The stingray's skin is turned into leather for our sneakers. Most of the meat is donated to our employees, with the remainder going to local markets. 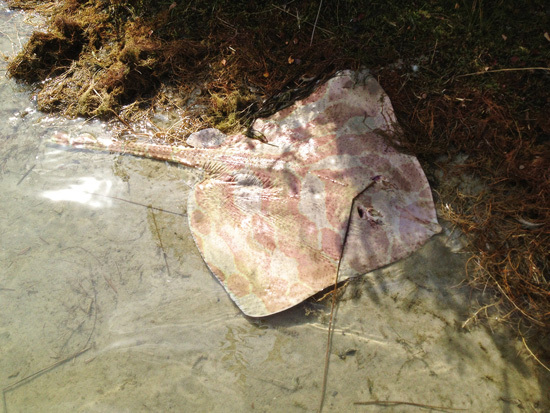 Stingray tastes almost identical to skate, another elasmobranch that’s often used to make imitation scallops. Ray is great steamed or simmered in a curry, but also delicicious when pan-fried with brown butter. Believe it or not, we even put the skeleton to use. Since rays are in the same family as sharks, they do not have hard bones like other fish, but instead have a skeleton made of cartilage. Sometimes cartilage is dried and ground up for health supplements, though our scientists here aren’t sold on whether these supplements actually do any good. Instead, we prefer a traditional Thai "peasant" preparation of frying the cartilage and serving it with chili sauce. 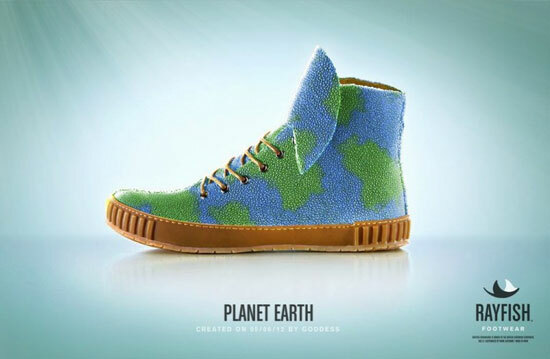 Julie Davis, aka Goddess, won with her conceptual and stylish 'Earth' design. Take this shoe as a starting point for your own design. Suzanne Martin is the winner of the second round with the original and classy golden dalmantian design. Good to see the happy owner with her shoes. Thanks for sending us the video of your design Suzanne! Take this design as your starting point. Humans have long admired the eye-catching patterns and colors of animal skins. While legend provides us with fanciful answers for how the leopard got its spots, science has another answer: Those spots and stripes come from a biological mechanism that acts just like a reaction-diffusion equation. In 1952, Alan Turing proposed the one of the first mathematical models for the formation of physical patterns. Using two chemicals called morphogens, one which activates pigment cells and one which inhibits them, Turing-type models are able to accurately predict the patterning of animals from giraffes to ladybugs. Until recently, these reaction-diffusion models did not have any experimental evidence to back up their claims. Where does color actually come from? 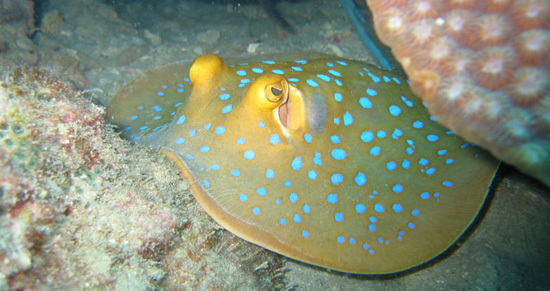 In cold-blooded organisms such as stingrays, a special class of cells called chromatophores are responsible for coloration. Chromatophore precursors, undifferentiated cells called chromatoblasts, move from the neural crest during fetal development and throughout the animal's body. Interactions between chromatophores produce the basic patterning units of stripes or spots. Once the basic pattern has been determined, a more complex set of genetic interactions determine the expression of specific colors. Controlling a stingray's adult pattern and coloration therefore involves controlling the timing of chromatoblast 'pulses' emitted from the neural crest during development, as well as controlling the differentiation of the chromatoblasts into color-specific chromatophores. While the field of artificial genetics has advanced quickly, it still is not sufficiently advanced to produce new DNA sequences. 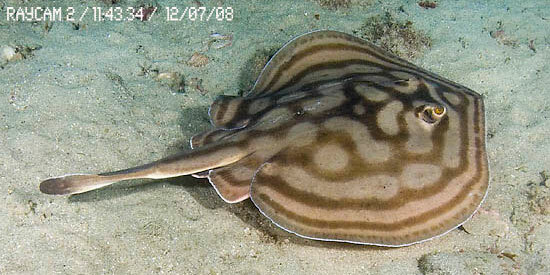 We therefore turned to existing animals to provide us with the basis for altering the pattern and coloration of the southern stingray (Dasyatis americana). In our initial experiments undertaken in 2010, we relied on the tiger rattlesnake for the relative simplicity of the gene sequence that controls its chromatoblast diffusion. The rattlesnake's regular, striped pattern is[predicated on simple reaction-diffusion equations and therefore a relatively short DNA sequence responsible for pattern-formation. From there, our scientists used microinjection to introduce the rattlesnake genes into stingray embryos. Using a tissue-specific promotor gene, we ensured that the foreign DNA would only be expressed in the skin, and not as color in the eyes or organs. Peter Zhu is the winner of the third round with the spectacular Chinese New Year design. Take Peter's design as a starting point for you own design. 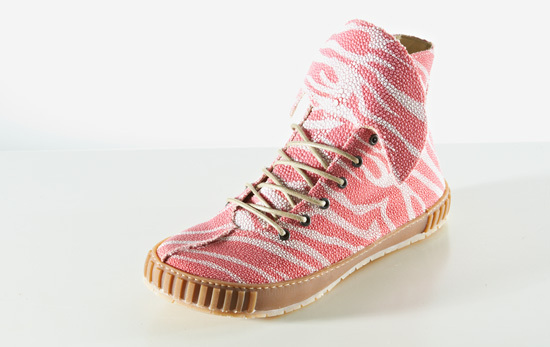 Daniela Fernandez was the first winner of our design-contest with her flamingo zebra design. After receiving her pair, she was so kind to send us a video of her wearing the shoes. Over the last few weeks, Rayfish Footwear has received hundreds of comments about our product – some excited, some upset. We would like to take this opportunity to address some common misconceptions about our company and the way we produce our stingrays. It seems many people are unfamiliar with the use of stingray leather in fashion, which is a relatively common application. Rayfish Footwear shoes come from stingrays raised for fashion - as does any leather from cows, pigs, alligators, ostriches and so on. Regarding the bio-customization of our rays, this process is essentially no different than what humans have been doing for centuries. Domestic animals, from dogs to chickens, are bred solely for human enjoyment and use. It is no more unnatural to have a transgenic stingray than it is, for instance, to have bulldogs with such large heads that they cannot give birth, or turkeys with such large breasts that they cannot mate. From farmed salmon to corn and soy, genetically modified organisms are already very common in scientific research and agriculture. Some, like the transgenic pet Glofish, have been widely available to the public for quite some time. Of course, we can understand that our practices would be objectionable from a purely vegan perspective. In any other context, we are puzzled by criticisms from people who otherwise eat meat, dairy or eggs, or who wear wool or leather. Rayfish Footwear opposes the harvesting of rays from the wild and is dedicated to ocean preservation. The stingrays’ meat does not go to waste, but is donated to our employees and local charities. Some have commented on the high price of our sneakers – part of the reason for this price is so that we can ensure that our rays live in comfortable conditions. 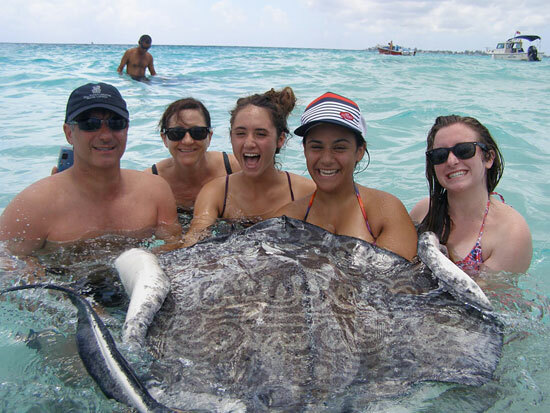 Our stingrays lead objectively better lives than any food animal raised in a “factory farm”. 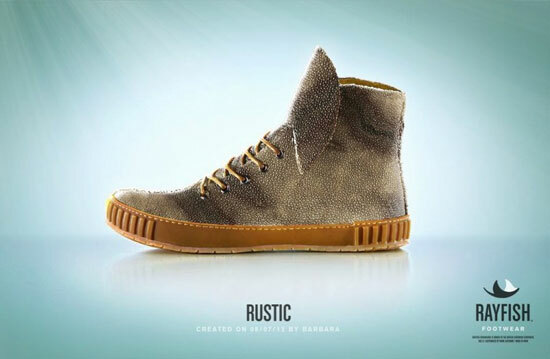 In fact, anyone who is concerned about animal welfare should consider Rayfish Footwear sneakers as a humane alternative to industrially-produced cow leather. The varied responses to Rayfish Footwear have given us valuable information on the public perception of our bio-customization technique. We continue to welcome your comments, and hope that the tone of the conversation will remain civilized. We've updated our presskit with loads of high quality images and video material. Go ahead and download it here. Suzanne Martin is the winner of the second round with the original and classy golden dalmantian design. Take Suzanne's design as a starting point for you own design. A blend between a Zebra and a Horse. 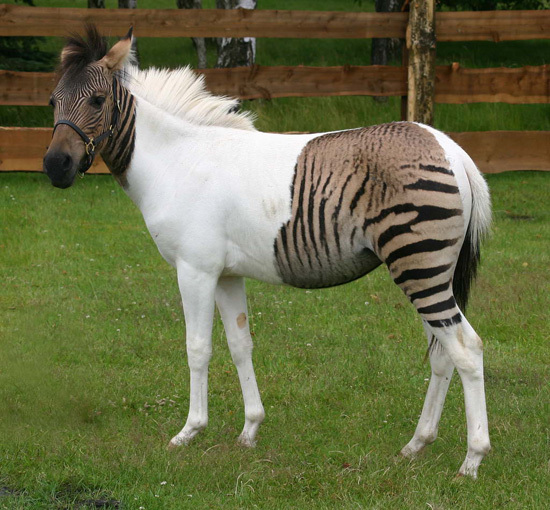 Zebroids have been bred since early 19th century. Mixing animal skin patterns. Nothing new really. A while ago, our CEO Raymond Ong gave a lecture at the Next Nature Conference, explaining how we remix the beauty & variety of nature into something nature could not have imagined. Watch the video. Daniela Fernandez is the first winner of our design-contest with her simple yet fashionable flamingo zebra design. Thanks for the inspiratoin Daniela! 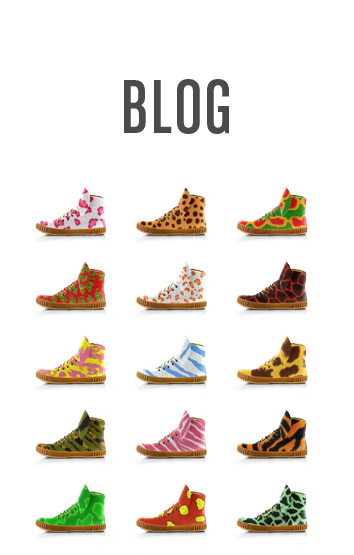 We have started breeding your shoes. Take Daniela's design as a starting point for you own design. Americans and Brits call it shagreen, the Japanese call it honzame, and the French call it galuchat, but one thing's for sure: Stingray leather is good-looking in any language. Though it's usually called leather, shagreen is actually the rawhide from sharks and rays. It's dried and stretched, but unlike leather, it’s not tanned. The word 'shagreen' probably comes from the Turkish word 'sagri,' which refers to a horse's rump. Some imitation forms of shagreen are made from horse or cow leather, but luckily, Rayfish Footwear keeps our shoes out of the pasture. Shagreen has been prized for centuries for its strength and appearance. Fisherman noticed the rough, nubbly texture of stingray and shark skin, and used it to sand wood. Ancient Egyptians were supposedly the first to use shagreen for decorative purposes, though this assertion might be more fancy than fact. 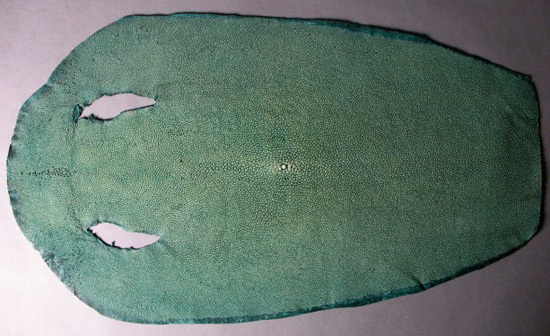 The skin of a stingray, with its calcified bumps, makes the perfect anti-slip surface for weapons. Samurai swords from Japan and Chinese Qing Dynasty bows used untreated shagreen for their grips. Though you won't find stingray leather in active duty anymore, it was used for military applications in Europe and the US in the 1800s, right through the American Civil War. Jean-Claude Galuchat, an 18th century expert in luxury materials, was the first European to pioneer the use of shagreen for the upscale market. He crafted high- end, stingray-wrapped goods for the likes of Louis XV and Madame de Pompadour. Shagreen experienced a second surge of popularity during the Art Deco craze in the 1920s. Not content with clutches or glass cases, designers during this time covered entire tables and dressers in shagreen. Rayfish Footwear is bringing shagreen into the future. No longer just for knights or kings, our stingray sneakers are for anyone with a sense of style. Jean-Claude Galuchet may have customized his shagreen designs for Madame de Pompadour, but we're the first to customize the whole ray. One fish, one shoe. One very long history!